I'm super excited to announce that I have a children's book coming out in September 2013! And it's published by Roaring Brook Press (Macmillan). 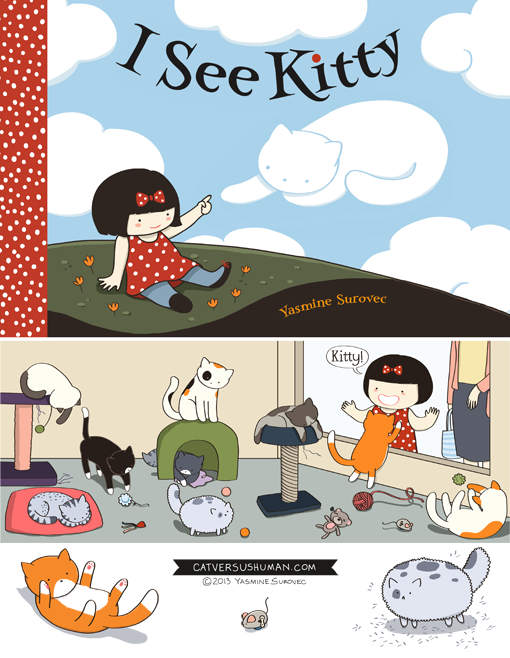 It's about a little girl who loves and wants a kitty so bad, she sees them everywhere. It's a 40-page hardcover picture book for children ages 3-6 years old. Oh, and I'll be at Book Expo America at the Javits Center in NYC on May 31 (Friday). If you're going to be at the convention, I'll be at table 23 from 3-4pm. See you there! Congrats Yasmine! I can't wait to see it! Love all your work, everything is super cute! Congratulations, I can't wait for it to turn up somewhere where I can get it to Finland! lol....for the first time I'm looking forward to buying a book! I'm probably more excited then when I heard the 2nd Star Trek movie came out. I think you just described my exact condition. I need this book. Children ages 3-6?!! No way, I haven't been 3-6 in uh, 40-odd years and I want one! Hey Jasmine, how about a story of a kitty that sees a little girl for a companion book. Any word about Cat Vs Human vol 2? Lemonade Swimming Pool is down! What's wrong with it?